Governance Structure | Corporate Governance | About Us | NIKKISO CO., LTD.
Nikkiso has the following corporate governance structure relating to decision-making, execution, and supervision of corporate management, which includes an audit & supervisory board as prescribed in the Companies Act of Japan. Nominees to be appointed as board members must be able to see the big picture when it comes to the Nikkiso Group's operating environment, and move quickly to boldly address important business issues, and deliver results. They must also be able to play a vital role in developing a corporate governance structure that supports the kind of transparent, fair, prompt, and bold decision-making needed to realize Nikkiso's corporate philosophy. Nominees to be appointed as outside directors must neither have any personal, financial, business or other relationships with the company, nor have any potential conflicts of interests with general shareholders so that being an outside director is the only relationship they will have with the company. As outside directors, they must be able to fulfill the role of overseeing directors in making decisions and performing their duties from an objective and professional standpoint independent from the company's operations. They must also be able to use their expertise to provide sound advice that will help the company achieve sustainable growth and enhance its corporate value over the medium- to long-term. Having held major positions during his career, including being former managing director of the Tokyo Stock Exchange, Inc., former member of the Financial Services Agency Business Accounting Council, and commissioner of the Financial Accounting Standards Foundation, he has close familiarity with corporate governance and compliance systems, in addition to his extensive knowledge of finance and accounting. He is expected to provide valuable advice for the continuous growth of the Group and to increase our corporate value over the medium to long term. For many years, she has worked on international projects such as in personnel, financial affairs, and industrial development of the United Nations. Furthermore, she has endeavored in activities for developing personnel who are active on the world stage. She is expected to provide valuable advice for building a Group environment where a diverse workforce can thrive in appropriate positions, starting with ensuring the effective functioning of the Board of Directors and promoting the active participation of women. Nikkiso uses the independence criteria set forth by the Tokyo Stock Exchange to assess the independence of outside directors. In interpreting and adopting this criteria, we substantively assess whether an outside director has any personal, financial, business, or other relationships with the company other than being an outside director or has any potential conflict of interest with shareholders so that he or she can fulfill the role of overseeing directors in making decisions and performing their duties from an objective and professional standpoint independent from the company's operations. Nominees to be appointed as audit & supervisory board members must, in addition to fulfilling the role of auditing company operations and accounting practices, be able to actively and willingly exercise their authority as well as express relevant opinions at meetings of the board of directors. At least one of the audit & supervisory board members must possess sufficient knowledge of financial and accounting practices. Nominees to be appointed as audit & supervisory board members must neither have any personal, financial, business or other relationships with the company nor have any potential conflicts of interests with general shareholders so that being an outside audit & supervisory board member will be the only relationship they will have with the company. As outside audit & supervisory board members, they must be able to fulfill the role of auditing directors in making decisions and performing their duties from an objective and professional standpoint independent from the company's operations. They must also be able to use their extensive knowledge to identify risks in business strategies and provide advice. He is an attorney who has been active in a wide range of corporate legal matters. He also has deep insight into corporate governance and compliance systems. He is expected to play an extensive role in monitoring the decision-making and business execution of the directors, from an objective and expert perspective. Through his activities as a certified public accountant and licensed tax accountant over the years, he has acquired abundant expertise related to financial affairs, accounting, and corporate management. He is expected to point out risks and provide advice relating to corporate management, based on a wide range of knowledge relating to finance, accounting, and corporate management. We help directors and audit & supervisory board members learn what they need to know in order to fulfill their roles and duties. Newly appointed board of directors as well as audit & supervisory board members receive specific training as needed in order to acquire or reacquaint themselves with the basics they need to serve in their appointed positions. Reappointed members receive specific training on business strategies, financial affairs, accounting, human resources, organization, etc. Training on accounting, personnel, compliance, insider trading, and other areas related to our company's management and operations as well as training on business strategies and plans is provided at executive officer meetings held several times a year, which all board of directors and audit & supervisory board members, including executive officers, attend. 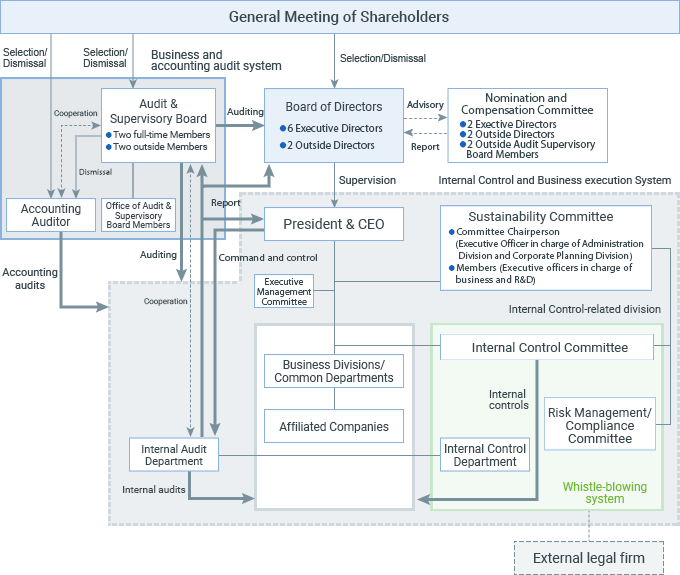 The board of directors maintains an optimal ratio of fixed compensation, short-term performance-linked compensation, and medium- to long-term performance-linked compensation in order to ensure that compensation paid to executive directors functions as a sound incentive for them to keep us on the path of sustainable growth. A draft version of director compensation is proposed to outside directors for advice prior to being submitted to the broad of directors. We do not employ anti-takeover measures. In order to enhance our corporate value and ensure the common interest of shareholders, control of our company is determined by those shareholders who gain a stake in the company through free and fair trading on the stock market.